While I was off jaunting around North America and UAE, my fellow Mumbaikers were exploring whiskies… This is a guest post by Nikkhil, a member of our original Mumbai whisky club. Nose: Citrus, lemon/lime hit which quickly faded into some mild honey followed by some baked/toasted cereal grain notes – think Marie biscuit. Then suddenly it turned solventy. The nose kept changing rapidly. Some odd notes of pressure cooker boiled peanuts. Hints of green apple. Overall very temperamental. And the initial citrus hit never returned. Palate: A swift uppercut! Hot but strangely not raw. Young and rather thin on the palate. We did speculate on this being a high strength bottling. Again just like the nose the heat faded quickly! Very little mouthfeel. Volatile. Bitter cereals, tannic and spirit driven. A very muted development. With water it turned more bitter. Some faint banana and herbal notes. We couldn’t quite place this spirit either in terms of its flavour profile or geography. Finish: There was none! We were all unanimous on that. Reveal: We were quite surprised (in disbelief) and those in the know of this brand were even more so. One member was disappointed as he had highly recommended it based on his previous encounter with Writers Tears in Glasgow. Another member was equally perplexed as this was high up on his wishlist having been recommended by an Irish whiskey aficionado.There was not a hint of the “pot still” character even though it claims to be a vatting of Irish single malt and Irish pot still. In my experience Irish whiskies always start spirit driven and solventy and benefit immensely given some time in the glass. Could it be the same with this one? Did we sample it too quickly? Perhaps I should have poured one more, let it rest and then revisited it. The discussion then turned to provenance or rather the lack of it when it comes to newer Irish whiskey with many NDPs (non distiller producer) sourcing the bulk of their matured stock from Cooleys and Middleton. 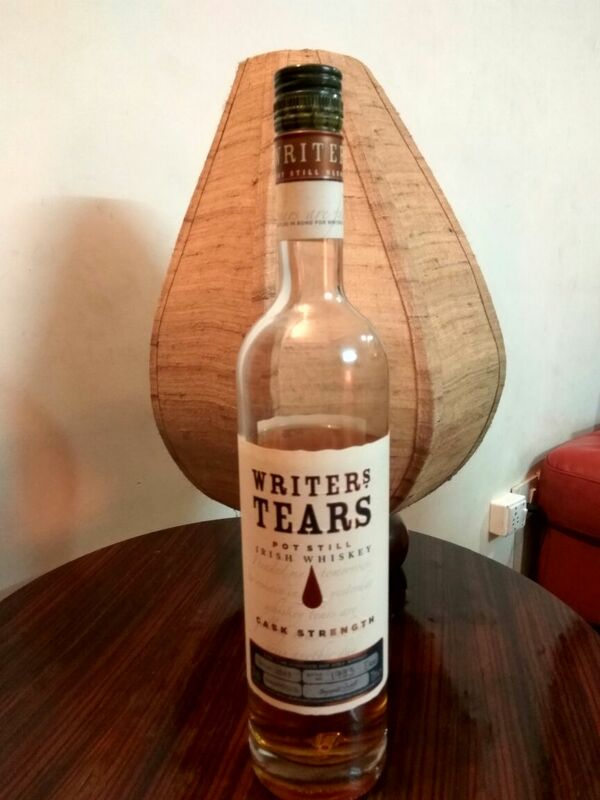 Writers Tears whiskies are a combination of unspecified Irish pot still and Irish single malt, triple distilled and aged in ex-bourbon casks. This bottle was sampled blind, opened in September 2017 in Mumbai for this tasting. It can be found online at the Celtic Whisky Shop for €150.00. The 2014 edition all appears to be sold out/discontinued on Master of Malt, however The Whisky Exchange still has the 2015 (2100 bottles at $151) & 2016 (2640 bottles at $151) available. This may be a cask where variation between the years makes a difference. What was stellar one year becomes merely average another year or – gasp! – even a disappointment. This entry was posted in Beyond Scotland, Ireland and tagged Cask Strength, Irish pot still, Irish whiskey, Writers Tears, Writers Tears 2013 Cask Strength 53% by Carissa Hickling. Bookmark the permalink.